Nintendo is offering a new version of the Wii for people that have trouble seeing the color white. After the usual rumors and advertisement scans that swirl around the internet in advance of a newly released system model, Nintendo has officially confirmed that it will be releasing a second SKU of the Wii in black. The Wii will remain at $199, but will come with a couple new additions as well. Already included with the purchase of a Wii is one Wii Remote, one Nunchuck, and a copy of Wii Sports. Along with the announcement of the yin to the white Wii's yang, Nintendo has revealed that all Wii's black and white will now come with a copy of Wii Sports Resort and a Wii MotionPlus attachment starting on May 9. 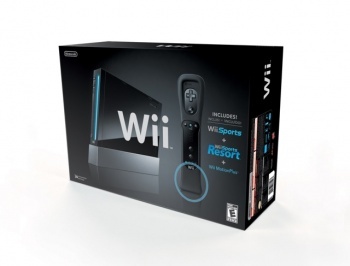 The MotionPlus is required for Wii Sports Resort, and is able to translate true 360-degree, 1-to-1 motion as opposed to the normal less-accurate wiggling and waggling from a Wii Remote by itself. A small selection of other games such as Tiger Woods 2010 support the use the MotionPlus, with cowboy-samurai game Red Steel 2 requiring it, but look at Nintendo to implement future required use in titles like the next Legend of Zelda. Wii Sports Resort itself is an amazing inclusion with this new Wii package, as it's much deeper than the original Wii Sports. The twelve sports included have multiple modes and ways to play, such as the Frisbee dog-catch that later leads to all-out Frisbee golf. A new color of the Wii might not be as anticipated as the constantly denied but still probably coming when Miyamoto says so Wii HD, but at least Nintendo is giving consumers some options and putting more value into the Wii. From a personal perspective, it seems they'll have to do much more than that to compete once Sony's PlayStation Move and Microsoft's Natal hit the market.